County Home Care is there to provide the extra service you need, when you need it. 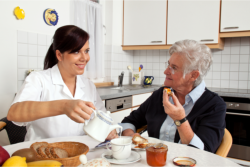 Be it a few hours a day, a 24 hour shift, or complete live-in care, our goal is to assist our clients as they need it. We make it possible for a recovery patient to come home sooner or to avoid returning to the hospital. Our services are especially beneficial to people who are frail, elderly, housebound, and accident victims. We can help terminally ill, chronically ill, acutely ill, and people with disabilities remain at home in comfortable and familiar surroundings. Our caregivers are employees of our company, which means that we do all of the work for you. We are committed to providing professional, ethical and quality service. County Home Care is the answer to independence for seniors and people with disabilities. Whether the services are for you or a loved one, County Home Care can offer respite to family caregivers and help extend and enhance living at home as a safe and comfortable alternative to institutional living without the stress of interrupted routines and changes in daily habits. While County Home Care cannot replace the love and support of an elderly person’s family, our caregivers provide helpful and necessary services needed to brighten the day, lighten the workload and ensure peace of mind. We provide local caregivers in all service areas and also provide Live-in services in New Jersey and Connecticut. If a need arises, we will strive to accommodate anyone who requires service outside these geographical areas. A County Home Care Representative will respond to any questions and provide additional information about our services and in-home assessments.